P4: Explaining Motion Linking together forces, energy and motion. 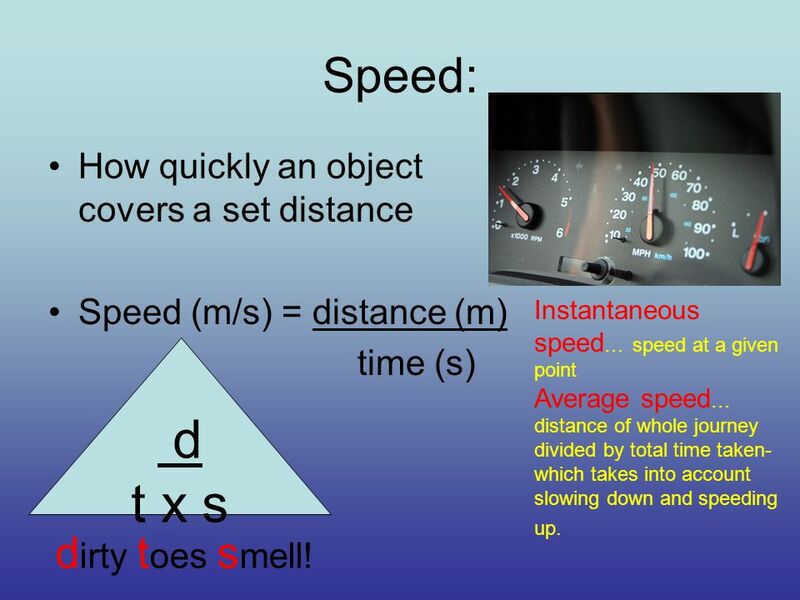 2 Speed: How quickly an object covers a set distance Speed (m/s) = distance (m) time (s) d t x s d irty t oes s mell! 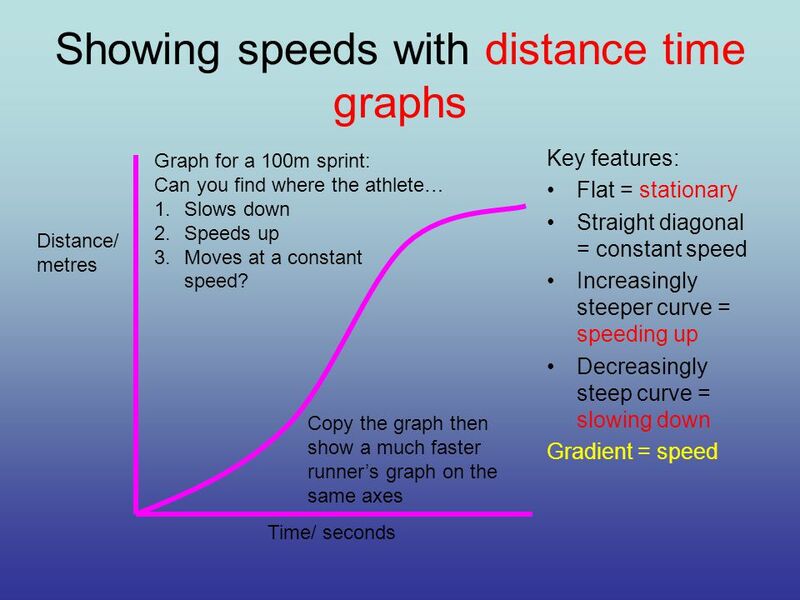 Instantaneous speed … speed at a given point Average speed … distance of whole journey divided by total time taken- which takes into account slowing down and speeding up. 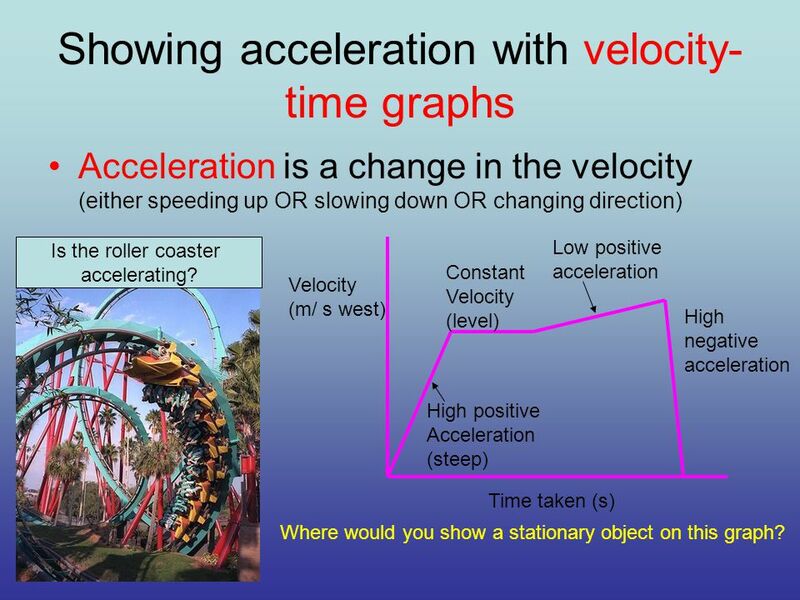 6 Showing acceleration with velocity- time graphs Acceleration is a change in the velocity (either speeding up OR slowing down OR changing direction) Is the roller coaster accelerating? 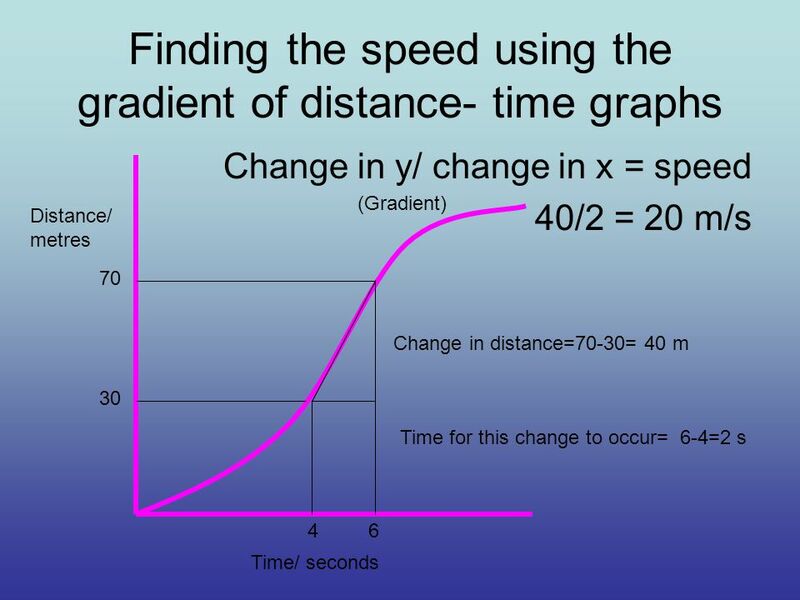 Velocity (m/ s west) Time taken (s) High positive Acceleration (steep) Constant Velocity (level) Low positive acceleration High negative acceleration Where would you show a stationary object on this graph? 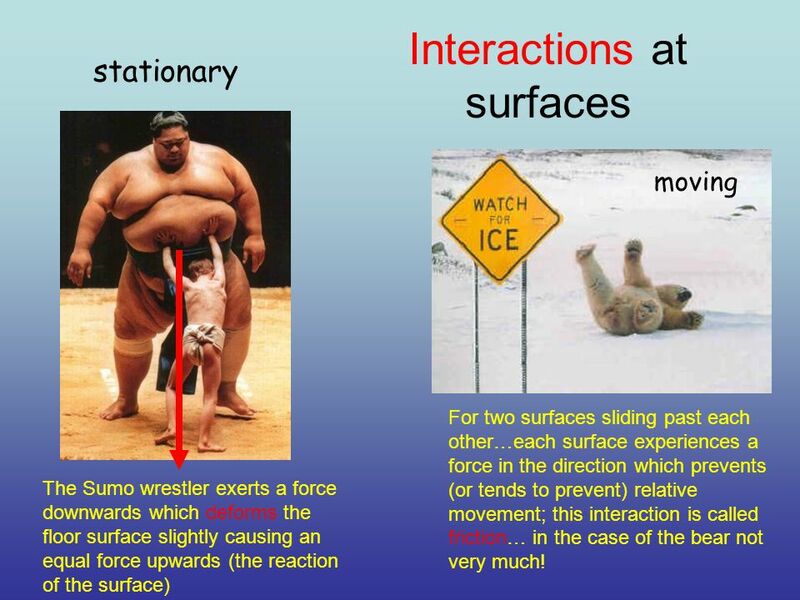 9 Interactions at surfaces The Sumo wrestler exerts a force downwards which deforms the floor surface slightly causing an equal force upwards (the reaction of the surface) stationary moving For two surfaces sliding past each other…each surface experiences a force in the direction which prevents (or tends to prevent) relative movement; this interaction is called friction… in the case of the bear not very much! 10 Resultant forces The overall effect of all the forces acting on an object taking into account their sizes and directions. e.g. 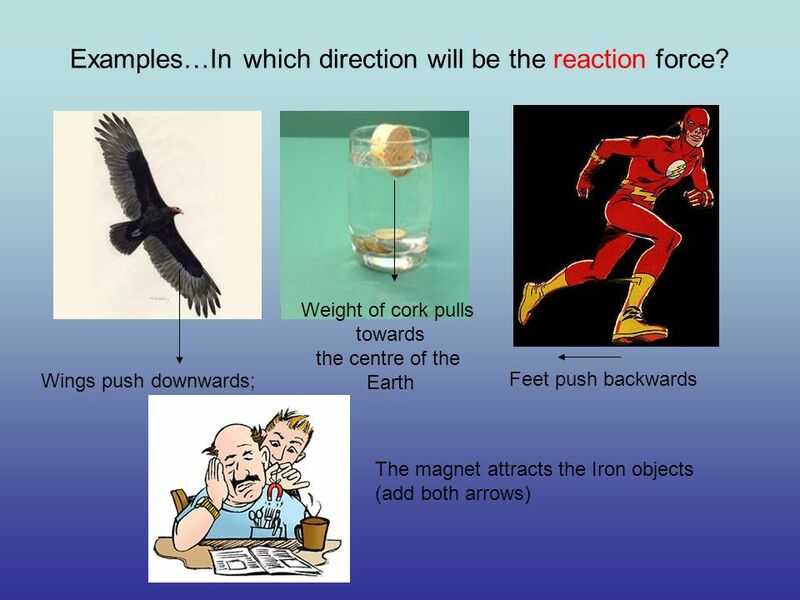 For a pendulum swinging back… In flight there are 4 main forces to consider! 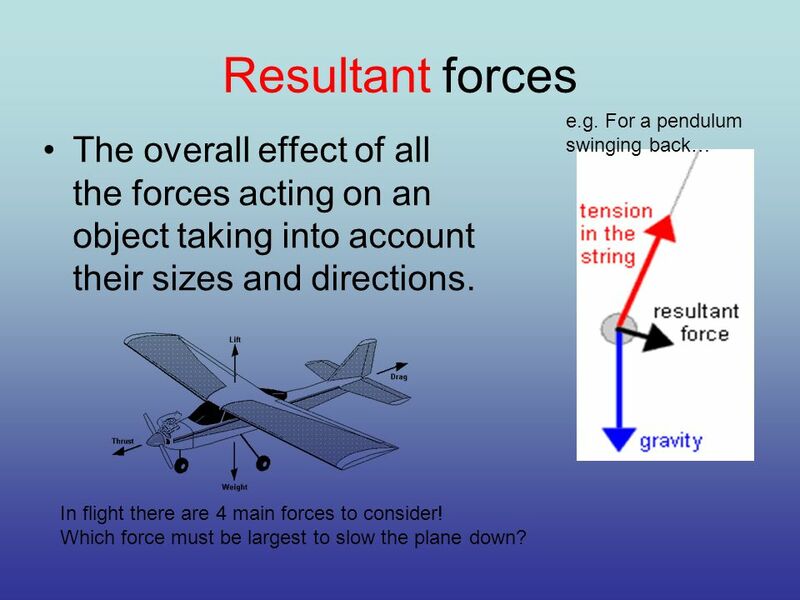 Which force must be largest to slow the plane down? 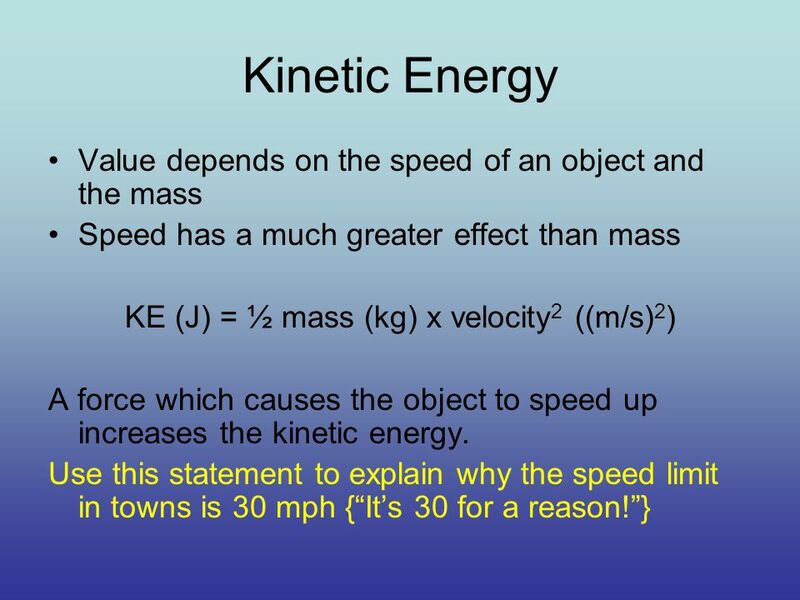 15 Gravitational Potential Energy Change in GPE (J) = weight (N) x vertical height difference (m) 2.5 m fall 800N man Show all the forces acting on the man (left) and make the resultant force clear. 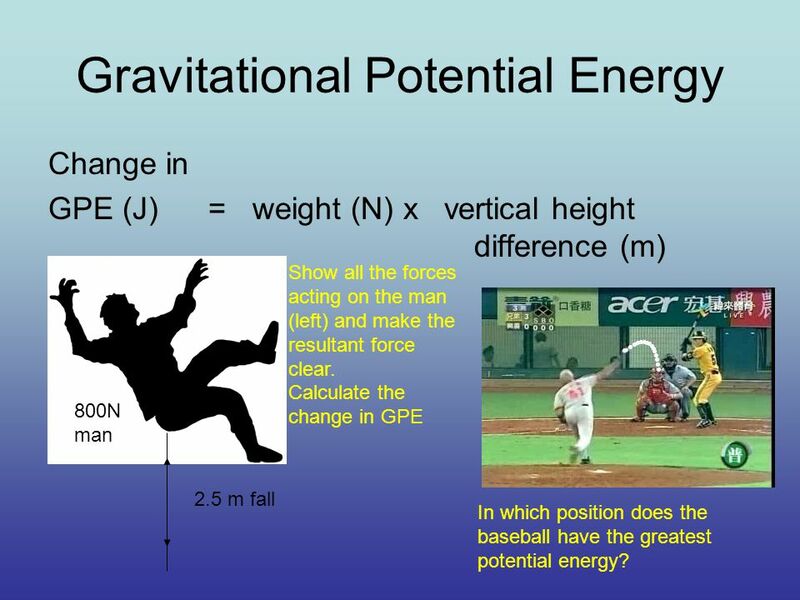 Calculate the change in GPE In which position does the baseball have the greatest potential energy? 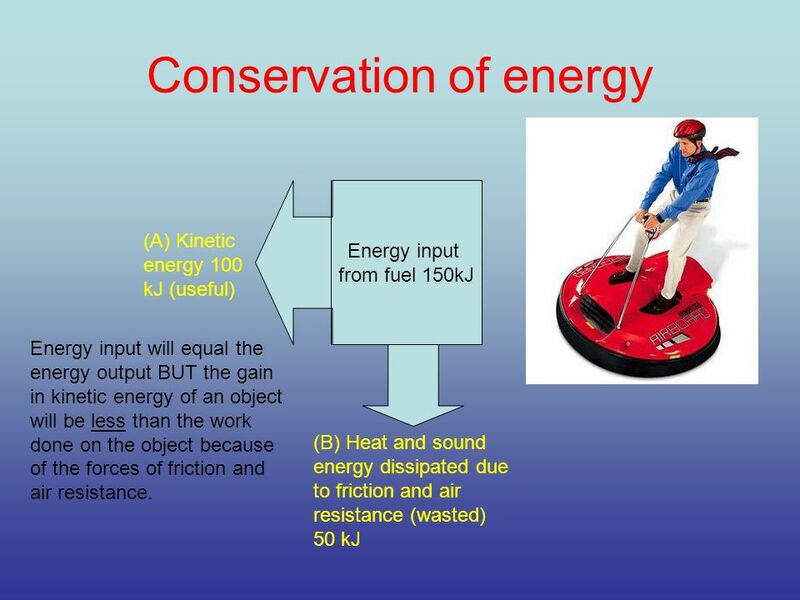 17 Conservation of energy Energy input from fuel 150kJ (A) Kinetic energy 100 kJ (useful) (B) Heat and sound energy dissipated due to friction and air resistance (wasted) 50 kJ Energy input will equal the energy output BUT the gain in kinetic energy of an object will be less than the work done on the object because of the forces of friction and air resistance. 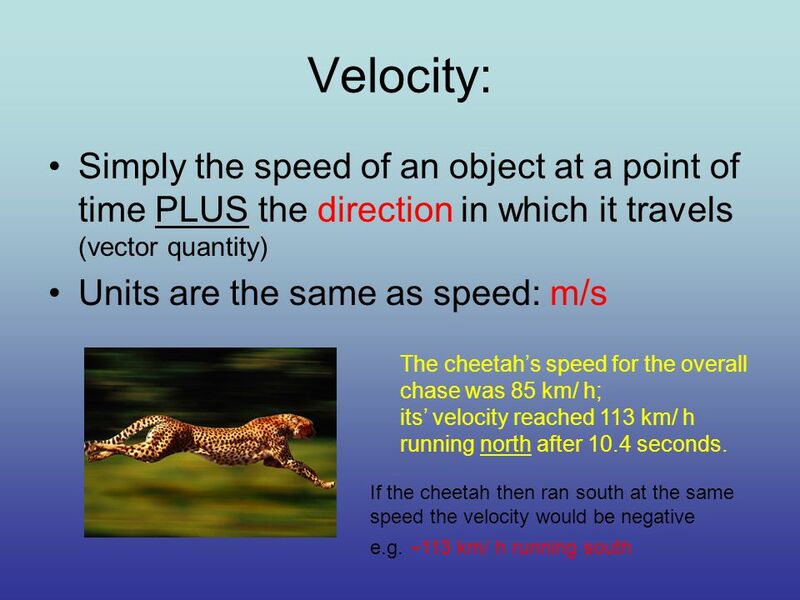 Download ppt "P4: Explaining Motion Linking together forces, energy and motion." 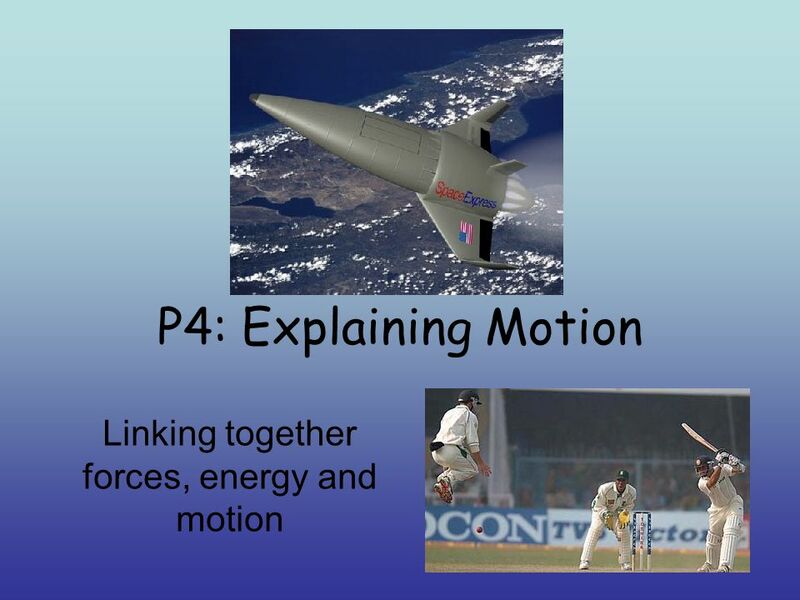 P4 – Explaining Motion. Average Speed Average Speed = Total Distance/Total Time. 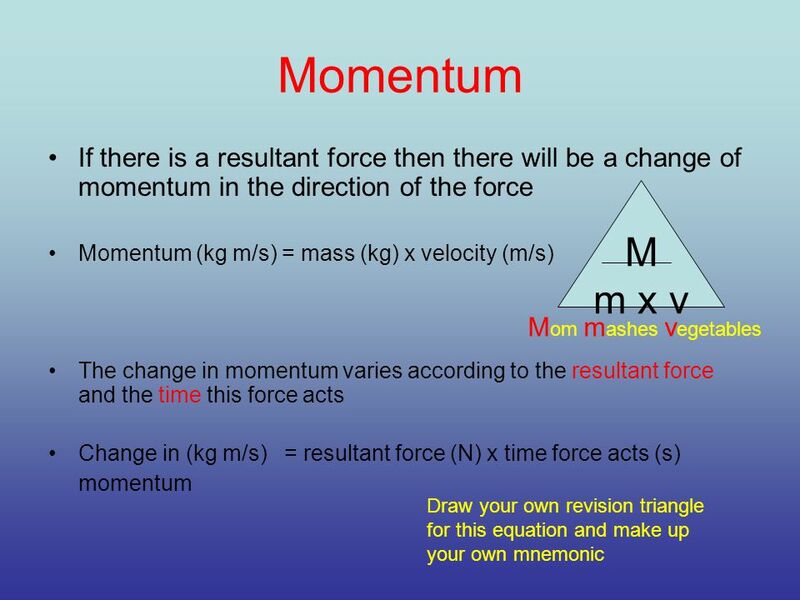 Explaining Motion Revision. 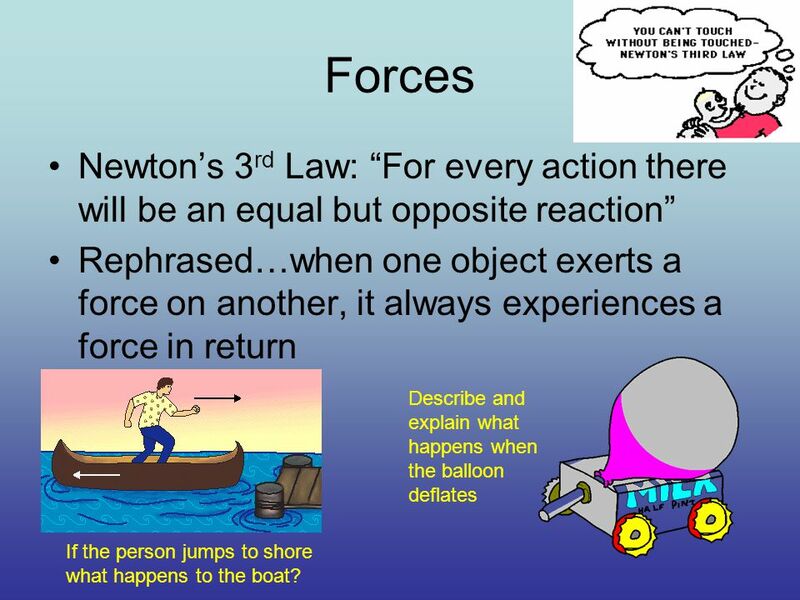 Forces Forces arise from an interaction between 2 objects. Forces arise from an interaction between 2 objects. In an interaction. Forces in all directions A force is needed to start anything moving. An interaction force arises between two objects. The green arrow shows the force. Forces. Distance, Speed and Time Speed = distance (in metres) time (in seconds) D TS 1)Dave walks 200 metres in 40 seconds. What is his speed? 2)Laura. 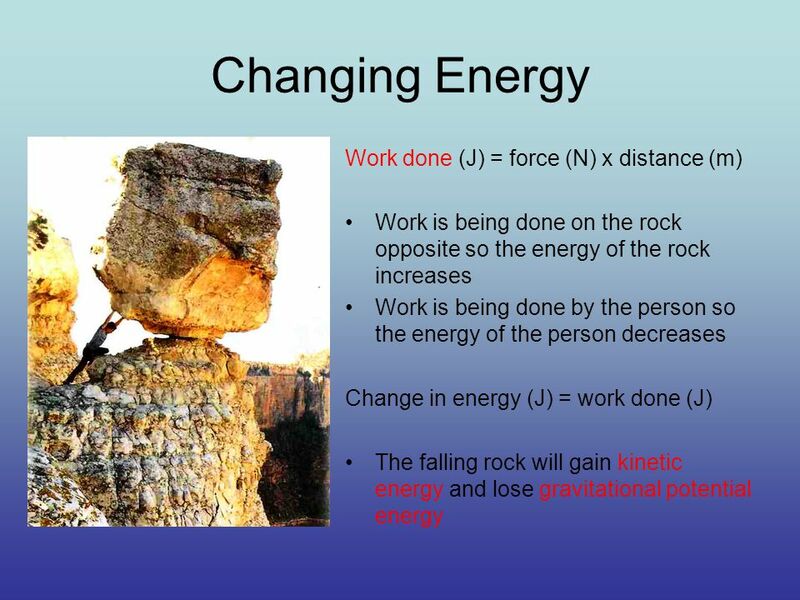 The Nature of Force Chapter 10 section 1. 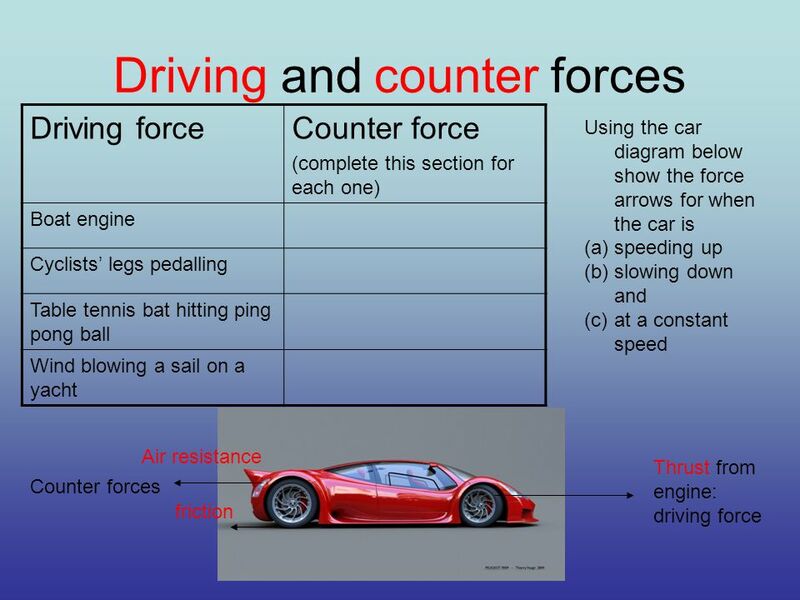 Unbalanced Forces and Motion Unit: 06 Lesson: 01. 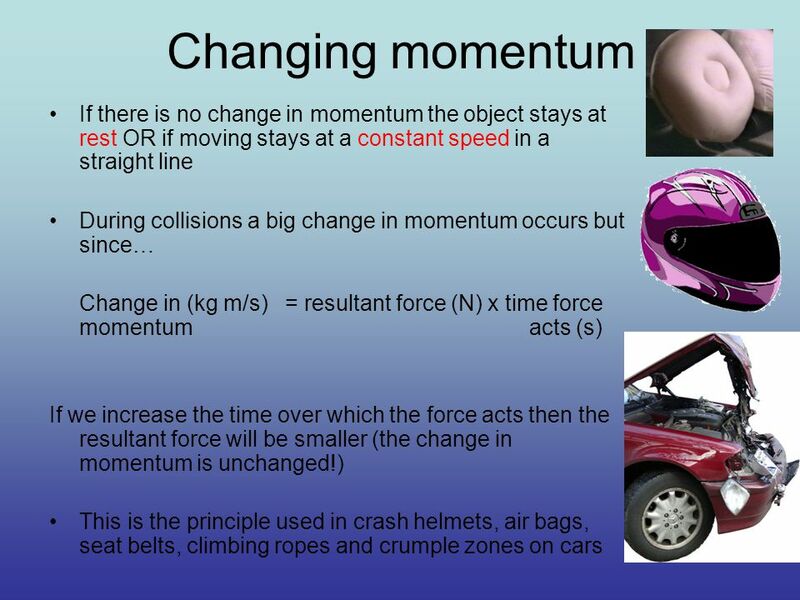 The Laws of Motion Chapter The First Two Laws of Motion Section 4-1 The British Scientist Isaac Newton published a set of three rules in. The graph represents relative position down your sidewalk, as you walk off your porch. Distance down your sidewalk (m) Time (s) Describe your motion When.